The new EP9214 power distributor box from BECKHOFF Automation enables local distribution and switching off of the power supply, providing the ability to exceed the power limitation specified by typical M8 plug connectors. An innovative I/O solution, the new power box also provides complete diagnostics and control functionality for up to eight 24 V DC branch circuits. 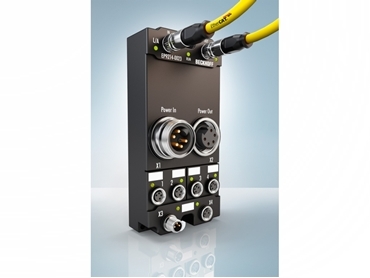 The IP67-rated EtherCAT box I/O modules typically use M8 plug connectors for supplying power, which according to the plug connector standard are only suitable for a maximum amperage of 4 A, making it impossible to simply loop the supply through, when modules have a large number of outputs. Another limitation concerns the cables since the M8 plug connectors can only be used up to a maximum cable cross-section of 0.34mm². If the cables from the control cabinet to the machine are long, an excessive voltage drop can occur at higher currents. As a result, the 24 V DC voltage (±15/20%) can no longer be maintained and the modules or connected sensors/actuators may not work properly. The EP9214 power box is the ideal solution for these challenges.